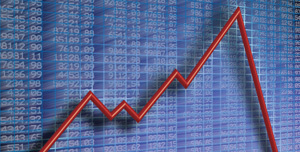 Investor caution and market-specific issues, such as the presidential election in Russia, put a damper on equity capital raised in the form of depositary receipts in the first quarter of 2012. There is pent-up demand in emerging markets, however, and DR bankers are optimistic that conditions will improve for issuers as the year progresses. DR capital-raising activity declined dramatically in the first three months of 2012 to $536 million from $6.4 billion in first quarter of last year, says Nancy Lissemore, managing director and global head of depositary receipt services at Citi. This performance was consistent with the decline in global-equity capital market activity in the same period, Lissemore says. A total of $150 billion was raised in the global equity markets in the first quarter, a decline of 26% from the same period a year earlier, and the slowest opening quarter since 2009, according to Thomson Reuters. 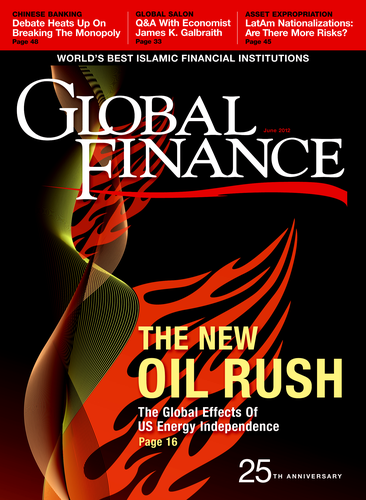 Global initial public offerings totaled $17.4 billion in the first quarter, a decline of 61% from the first quarter of 2011. In the US market, the Jumpstart Our Business Startups (JOBS) Act, signed into law by President Obama on April 5, will give companies more flexibility in going public and could stimulate the IPO market, Lissemore says. The law removes Securities and Exchange Commission restrictions that prevent “crowdfunding,” so entrepreneurs can raise equity capital from a large pool of small investors who may or may not be considered accredited. Trading of DRs, which set a record last year, declined by 9% in volume terms and 23%, by value, in the first quarter, compared to the first three months of 2011, Lissemore says. “Projections for the remainder of this year depend on the market trend and volatility,” she adds. The strong stock market performance of the BRIC countries (Brazil, Russia, India and China) and other emerging markets in the first quarter of 2012 caught some investors by surprise, says Anthony Moro, managing director and head of emerging markets DRs at BNY Mellon. 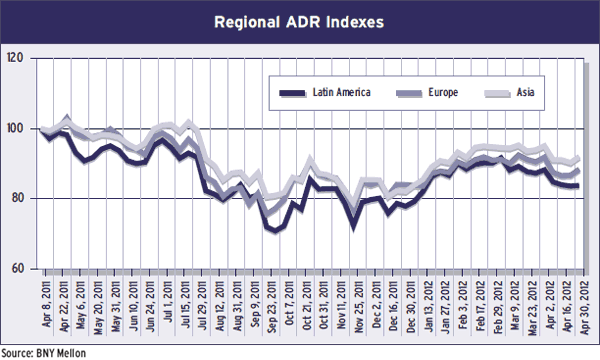 The bank’s BRIC Select ADR Index rose more than 13% in the first quarter, and its India Select DR Index rose 22.6%. The BRIC countries have been leading DR capital raised for the past few years and are likely to do so again in 2012, according to Moro. BTG Pactual, the Brazilian investment bank, raised $1.93 billion on April 24, in the largest Brazilian IPO since Banco Santander Brasil went public in 2009. The issue, which trades on Bovespa and the Alternext Amsterdam’s MTF segment, may have reopened the Brazilian market for other financial services issuers, but they will have to time the market carefully, Moro says. “The queue of companies waiting to issue from China and India is longer than ever,” Moro says. Many of these companies will likely wait for their June financials to be audited before they schedule any road shows, he says. Mongolian coal miner Erdenes Tavan Tolgoi delayed a $3 billion IPO in London and Hong Kong and may list locally first, as part of the government’s plan to give citizens shares in the company. There is also interest in such sub-Saharan African countries as Zambia, Angola and Tanzania, Moro says. Dennis Bon, global head of depositary receipts at J.P. Morgan, says that despite difficult market conditions, good companies with good management will still find investor interest. “There is a lot of money sitting on the sidelines,” Bon says. Although the BRIC countries accounted for more than 70% of the equity capital raisings last year, the first quarter of this year brought some issues from non-Brazilian companies in Latin America, Cementos Pacasmayo of Peru and Bancolombia of Colombia, he says. There were one or two big issues early last year, including some follow-on offerings, that skewed the comparison with this year, Bon says. Many Russian companies took a wait-and-see approach during the election campaign, so there could be some big deals in the coming months, he notes. Governance and accounting issues at a number of Chinese companies last year had an impact on general market sentiment, Bon says. He foresees a significant number of Chinese DR issues in the second half of this year. “There is a lot of interest in the DR [depositary receipt] product—both ADRs and GDRs,” Bon says. “We are also expecting to see further interest in single-listed DRs from developed-market issuers.” A single-listed DR is one whose underlying shares are not publicly traded in the issuer’s home market. Local DRs structured to appeal to equity investors in emerging markets will continue to develop, Bon says. Additionally, he says US companies could consider Hong Kong DRs, following Coach’s listing in Hong Kong. DR issuances from frontier markets, such as Iraq, Vietnam and Mongolia, are also possible, he says. Akbar Poonawala, regional head for the Americas of global transaction banking and head of global equity services at Deutsche Bank, says the BRIC countries seem to be taking a break in what is currently perceived as a risk-averse world by investors. The Russian DR market in particular has been affected by the debt crisis in Europe, he says. Some Russian issues that had been planned for the third quarter have been pushed back to the fourth quarter or to early 2013, Poonawala says. Russia’s central bank says it is ready to sell a 7.6% stake it holds in Sberbank, although no decision has been made on the timing of the sale, which could total about $5.5 billion at its current market value. The Russian state will still hold a slight majority of Sberbank’s shares following the planned partial privatization. Brazil is the only BRIC country that is expected to see some significant DR activity this year, although the country’s economic growth has slowed, Poonawala says. Some of the N-11 countries (Next Eleven growth markets identified by Goldman Sachs research) are coming to the fore, such as Indonesia and Turkey, he says, but so far there have been few new DR issues from these countries to raise capital. The Next Eleven were identified by Goldman Sachs in 2005 as countries likely to be among the world’s largest economies in the 21st century. They also include Bangladesh, Egypt, Iran, Mexico, Nigeria, Pakistan, the Philippines, South Korea and Vietnam. Deutsche Bank was the first depository to sponsor a GDR for a Vietnamese company. Hoang Anh Gia Lai, a conglomerate, raised $60 million on the London Stock Exchange last year. Nevertheless, the overall number of new issues (including those that did not raise new money) has outpaced cancellations so far this year. There has been strong issuance from the UK, France and Hong Kong, while cancellations have taken place in Japan and South Africa, he says. The sectors that are active include aerospace, business services, chemicals, leisure, retail, telecommunications and utilities.